If you wanna add some retro to your style you'll definitely accomplish it with this Handmade Silk Tie with Texture in Gray and Black made by BlackBird. 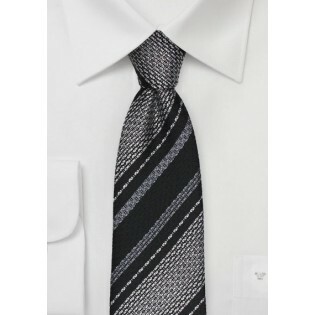 The gray hues play off one another in this tie. The woven texture allows for the retro feel creating a wool sweater appearance. 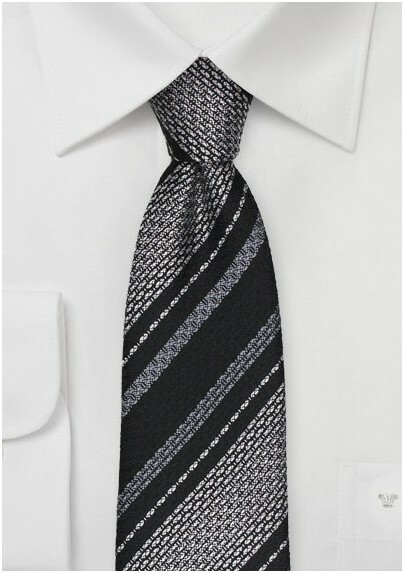 Speaking of your appearance, it'll be riddle with sophistication when you pair this tie with a charcoal gray fitted blazer and light silver button up. Its silk fabric adds a level of sophistication that plays with the way it appears on your chest. Fabric: Woven Spun Silk | Length: 58", Width: 3.0"